MedEdWorld is an international health professions community of individuals and educational organisations whose purpose is the sharing of information, ideas, experience and expertise. 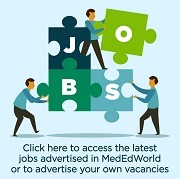 MedEdWorld was launched by AMEE in 2009 to help all with an interest in health professions education -including teachers and trainers, educationists, researchers and administrators - to learn, connect and debate about the latest developments in the field. In 2012 an extensive redevelopment of MedEdWorld took place and the new MedEdWorld website launched. A number of exciting new services are now available to members. The navigation of the site has also been improved and we hope you find the new website more user-friendly both when you access MedEdWorld and add items to MedEdWorld. For an over view of the MedEdWorld website watch our Youtube video. Valuable new facilities include: links to MedEdPublish, an e-library of previously unpublished papers relating to health professions education; a new database of Masters’ courses in health professions education; and the MedEdWorld Glossary, a dynamic database that is a source of information about the expanding vocabulary used in medical education. 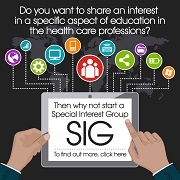 This will support institutional members who require educational assistance in specific areas to identify consultants with appropriate expertise. While anyone can access and browse the site, registration as a user (at no cost) offers further benefits. MedEdWorld access is a benefit of individual and institutional AMEE membership. 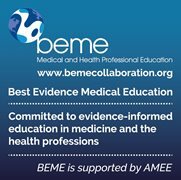 Full information about AMEE membership is available on the Join page.